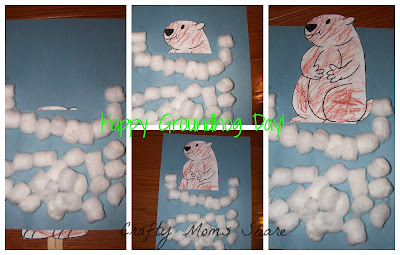 So last night I noticed that Tippytoe Crafts had shared an adorable Groundhog Day Craft. This one was easier than the one we tried last year and she provided two links to pictures of groundhogs to color. We of course had to try both. 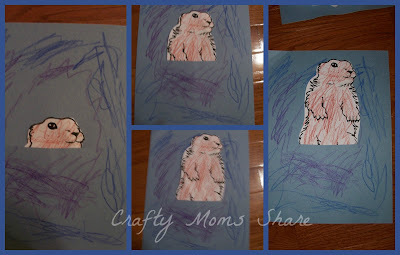 Hazel wanted to decorate one with snow and color the other with blue and purple snow. This morning Steve and I went to Hazel's school to see the film Play Again. This is a documentary about the generation growing up with more time indoors and in front of screens then outside and exploring the real world. It is really scary to think abut what the consequences of this may be. If you think about the fact that children in the United States spend 90% of their time indoors and about 11 hours a day in front of a screen (television, computer or video). Many kids are learning on screens now and this is not the same as learning by exploring nature. They are also showing that their brains are being developed differently because of this screen time and exposure to violent video games (I believe the statistic given in the movie was 7 out 10 kids say they have played a video game rated M for Mature). You can read an article in Bamboo Magazine about the film. Think about it, many children's exposure to nature is on a screen. You can learn many things about an animal or a flower on the computer or a television show, but can you really experience it and understand it that way. Is that really how we want this generation to think of nature? One of the specialists in the film asked the viewer to think about his/her most magical childhood memories. Where are yours? Most I would guess do not include a television, movie or computer. In fact I would even guess most are outdoors. I know mine are. So what are we doing to our children today with their overfilled schedules and very little free time to explore the world and to just be in nature? Have any thoughts? I know I said to Hazel's teacher after the film that I was glad we made the choices we have for Hazel. Her teacher had just mentioned how she was trying not to think about the scary side of the film and where our world could be going. I know I work hard to get Hazel to be in nature as much as possible. Plus our choice of Waldorf education also gets her outside. The other day when I picked her up from school she was covered in mud. I mean covered completely. We had an appointment to go get our picture taken at Sears right after school. I took her outer layers off and had luckily brought extra shoes. Her rain pants (first time she wore her new ones) were caked with mud as was her jacket and boots and mittens. I through everything into the trunk and took her to Sears. When we got to the studio I took her shirt that she had under her dress off since the sleeves were muddy and we hid the mud spots on her tights and the ties of her dress. But to me seeing her all muddy meant she had a great day. None of it bothered me, because I know it is important part of childhood to enjoy the mud. I always try to encourage it, so I was happy to see her that way. She is still talking about playing in the mud on Thursday and how much fun it was. So do you let your children have time to just play outside like we did when we were little? Why or why not? What effect do you think this change in society will have? Love those groundhogs! Thanks for linking back to me!